Patriot Docks line of manual lifts is the answer to your shoreline needs. No more cables to break. No more wheels to turn. The all marine grade aluminum manual lifts are a cost effective solution to protect your watercraft investment. The Single Watercraft Bunk Lift is an excellent option for raising your fishing boat or PWC out of the water for dry storage. The Single Watercraft Bunk Lift uses stationary legs on the shore end of the lift that are set to the desired raised height, while the lake end of the lift is supported by aluminum screw jacks that raise the rear of the lift to the storage position. Operate each jack incrementally to raise the lift to the storage position. Includes manual hand crank or the jacks can be operated using a cordless drill with 3/4″ socket driver. The Single Bunk Lift includes brackets and hardware for mounting one pair of bunks (bunk material not included). The included poly bumpers make for a safely guided entry onto the bunks. The standard model is designed for water depths ranging from approximately 12″ to 48″ on the lake end of the lift. Additional accessories available include Bunk Pads to reduce friction while loading and unloading, extra long Drop Legs and Jacks for deeper water applications, additional jacks for 4-corner adjustment and axles and wheels to create a rolling storage cart. The lift has an entry beam of 60″, overall frame length is 96″. 1,200 lb. lifting capacity. The Double-Wide Watercraft Bunk Lift is an excellent option for raising your fleet of small fishing boats, compact pontoons or PWC’s out of the water for dry storage. The Double-Wide Watercraft Bunk Lift uses stationary legs on the shore end of the lift that are set to the desired raised height, while the lake end of the lift is supported by aluminum screw jacks that raise the rear of the lift to the storage position. Operate each jack incrementally to raise the lift to the storage position. Includes manual hand crank or the jacks can be operated using a cordless drill with 3/4″ socket driver. The Double Bunk Lift includes brackets and hardware for mounting two pair of bunks (bunk material not included). The included poly bumpers make for a safely guided entry onto the bunks. Additional accessories available include Bunk Pads to reduce friction while loading and unloading, extra long Drop Legs and Jacks for deeper water applications, additional jacks for 4-corner adjustment and axles and wheels to create a rolling storage cart. The Double Bunk Lift has a beam of 108″ and overall frame length of 96″. 1,600 lb. lifting capacity. Patriot Docks canopy frames and covers are heavy duty and made to last. We use a custom square aluminum profile for the framework of the canopy and free standing base that is very rigid. Stainless steel fasteners secure the components together. 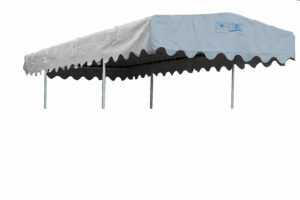 The canopy material is among the toughest on the market with a PVC coating weighing over 18oz. The canopy cover is tightly secured to the canopy frame using ball bungees secured through “D” rings double stitched onto the canopy cover. Free Standing Canopies include a pair of wheels allowing for easy install and removal. The Free Standing Canopy is the answer for cover down by the lake. The Free Standing Canopy measures 120 inch wide x 24 ft. long. This canopy frame has been designed to be the best boat lift frame cover or free standing canopy on the market. The frame is made of all aluminum components that assemble quickly and designed to protect your marine investment. 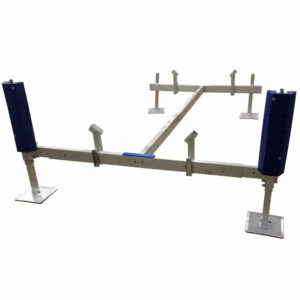 The frame is 18 inches high creating head space for maneuvering. The Free Standing canopy frame includes the aluminum base that allows this unit to stand on its own. Each corner of the base has adjustable height settings along with one end having adjustable flat bases and the other having adjustable wheels for easy install and removal. The maximum canopy clearance is 9 ft. from the base frame to the canopy frame. 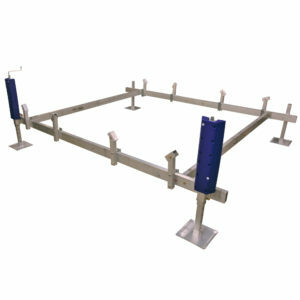 This unit includes augers with pipe that attach to the frame for anchoring the frame in place. 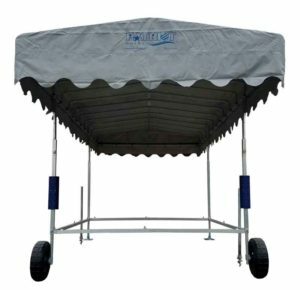 The Boat Lift Canopy Cover and Frame includes four 4 ft. aluminum pipe supports with adjustment holes for the perfect height. The unique fastening system enables this canopy to fit just about any boat lift between 108” and 120 “ wide. The kit includes four 4ft. long aluminum pipe supports and 12″ expansion sleeves to accommodate the following vertical upright dimensions: 2″ i.d round or square, 2-1/4″ i.d. square and 2-1/2″ i.d. square. Measure the inside dimension of your boat lifts vertical upright to ensure compatibility.